According to all of the research that I could dig up, it appears that due to the poor overall quality product that was being by both Fender and Gibson at the time and a strong desire by some amazingly creative people, a couple of small shops such as this sprouted. 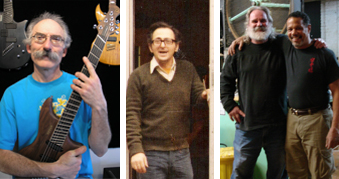 In NYC it was the Guitar Lab (LoBue Guitars) and on the west coast Alembic. In talking with Rick Turner, one of the founding members of Alembic Guitars and now owner of Renaissance Guitars, it is his belief that he and LoBue were possibly two of the only builders of high quality custom and hand built electric guitars in the country in the late 60’s and early 70’s. Certainly no other prominent builder comes to mind when considering the use of these instruments by professional recording musicians. All that is left of Charles LoBues work are a few fine instruments, LoBues legacy, and unfinished work. It is unknown how many total guitars were made by LoBue and his crew of talented associates between 1969 until LoBue’s untimely death in 1985 but one thing that is certain, he made fine, beautiful high quality instruments. It has been an honor to research this mans work for all to see. Many thanks to everyone who provided information, guidance, photographs and support in these efforts. I’d like to specifically thank, Lorraine Dell, Dennis Kong, Ralph Novak, Woody Phifer and Bob Sindorf who’s information and support were priceless. In addition, I’d like to thank all of the contributers including, Mike Babyak, Jonathan Blank, Alex Carozza, Carmine D’Amico, Ed Diehl, Pete Fine, Richard Friedman, Ritchie Fliegler, Michael Gurian, Steve Khan, Bill Lawrence, Chuck Ruff, Ivon Shmuckler, Wendi Simmons, Carl Thompson, John Tropea, Rick Turner, Matt Unanov, Dino Walcott, Heinz Weidenbrueck, Gary Kremer and Lawrence Wheatman without who’s help this project would have been much less successful.